A graceful light shines at "The Light in the Piazza"
Theo Ubique's "The Light In the Piazza"
I really have to stop second guessing the talented folks at Theo Ubique. The group that managed to make Andrew Lloyd Webber’s shabby tabby of a show “Cats” both relevant and watchable once again last season can add another accomplishment to their belts. Their current production of Craig Lucas and Adam Guettel’s vocally-challenging “The Light in the Piazza” manages to be heartfelt and intimate at the same time it is operatically grand. 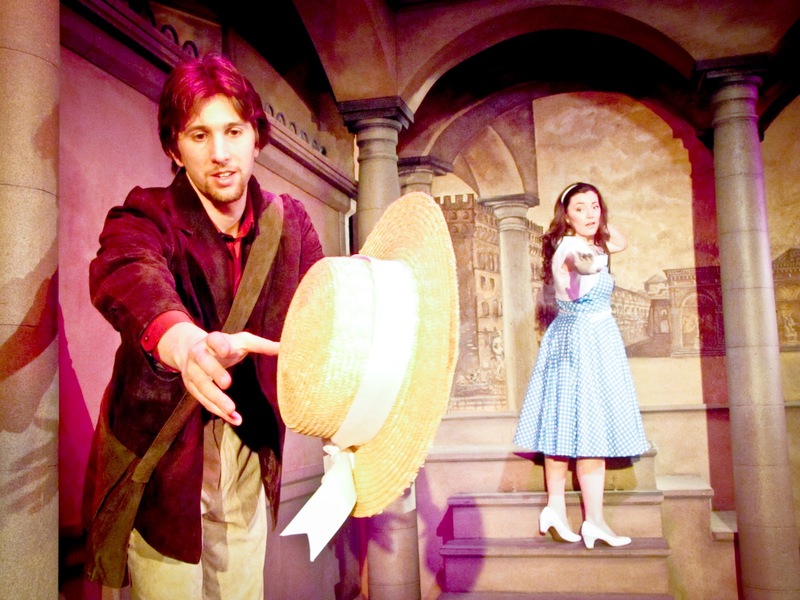 The company’s artistic director Fred Anzevino and his co-director on the production, Brenda Didier, have once again discovered some amazing talent to cast their show. 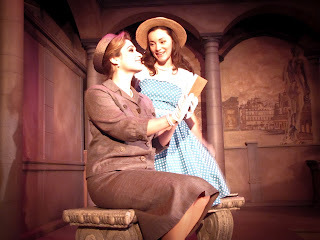 Kelli Harrington as Margaret, opposite Klippel as Clara. Kelli Harrington is relatively unknown in Chicago theater circles, but that could all very well change thanks to her painfully truthfully and emotionally intense portrayal of Margaret, the 1950’s era housewife who embarks with her intellectually-handicapped daughter Clara on an odyssey to find the ruins of her once happy marriage in an Italian village that was the sight of her honeymoon. As Clara, Rachel Klippel deftly avoids playing up too much of her character’s handicap and instead delivers a captivating portrait of a young girl whose zest for life and willingness to fall blindly into love has you wondering if fully-able people are truly the ones with a handicap. As Clara’s love interest Fabrizio, Justin Adair brings some emotional vulnerability and sweetness to the role. Like Klippel and Harrington, he is more than capable of singing the demanding score, too. As Signor Nacarelli, Fabrizio’s gruff, womanizing father, Michael Kingston also manages to find a subtle kindness to the character. Denise Tamburrino, as his wife, nearly brings the house down when her character steps away from speaking Italian to explain what is going on in “Aiutami.” Pavi Proczko turns in a fine comedic performance as Fabrizio’s ne’er-do-well brother Giuseppe. Elizabeth Lanza seems to channel a young Sophie Loren as Giuseppe’s long-suffering and much put upon wife, Franca. Adam Veness’ set, featuring sun-drenched and weathered beiges, allow the colorful period costumes by Bill Morey to really pop (the sepia-toned publicity photos don't do the costumes justice). Music director Jeremy Ramey’s quartet of three strings (including a harp) and piano offer some new-found clarity and intimacy to Adam Guettel’s score. Like a return trip to Italy, you will still find much to discover even if you are familiar with it. Time and time again, Theo Ubique manages to reinvent and inspire. Quite simply, no other Chicago store front theater deserves to have a larger, national profile than Theo Ubique. To my national Broadway World readers: don’t take my word for it. Fly to Chicago and see this talented and amazing cast in this show. 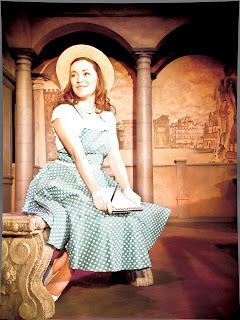 “The Light in the Piazza” runs through April 29 at the No Exit Café, 6970 N. Glenwood. Tickets, $29-$34. Option $20 three-course meal also available. Call (773) 347-1109 or theo-u.org. Pom Poms up for "Bring It On: The Musical"
Gimme an “H”! Gimme an “I”! Gimme a “T”! 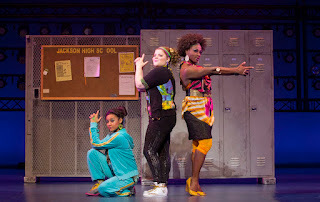 Yes, the cheerleading-centered musical is indeed a surprise hit. Much like the film franchise whose sequels merely feature the premise of two rival cheer squads and no recurring characters between them, “Bring It On: The Musical” merely uses the premise of competitive cheerleading to hang its narrative about alienation, friendship and good old-fashion high school backstabbing on. Campbell (the likeable and somewhat understated Taylor Louderman) is the head cheerleader at a whiter-than-white suburban high school and she’s that rare, nice popular girl who is kind to everyone, not just her besties. On the eve of the start of the school year, her home is redistricted as a result of some possible sneaky maneuvering by her sophomore rival Eva (the sweet yet conniving Elle McLemore). Campbell, along with the team’s full-figured, geeky mascot Bridget (the hilarious Ryann Redmond) find themselves attending Jackson, the diverse and rougher inner city school across town. From there, things are turned upside down. The once popular Campbell is an outcast. The bootylicious Bridget, however, suddenly finds that she is attracting both the attention of the boys and the school’s dance crew, led by Danielle (the terrific Adrienne Warren). 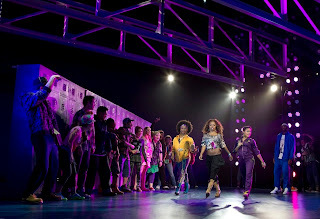 Other standouts in the cast include Gregory Haney as a transgendered cheerleader La Cienega, and Jason Gotay as Campell’s love interest Randall. Gotay’s performance of the ultimate teenage anthem “Might As Well Enjoy the Trip” is positively swoon-worthy. Danielle (Adrienne Warren, center) rules the roost at Jackson High. It’s not only the main characters of the play who find their souls at Jackson. Directed and choreographed by Andy Blankenbuehler manages to find the heart and the soul of the show there, too. The show stops being a cross between “Mean Girls” and “Legally Blonde” to actually delve, albeit briefly, into issues of class, race and even political power. Producers have wisely assembled a Tony-award winning creative squad here. The book is by Jeff Whitty (Tony winner for “Avenue Q”), the lyrics are by Amanda Green and Lin-Manuel Miranda (the former is a recipient of the Jonathan Larson Award, the latter the Tony winner for “In the Heights”) and the music is by Miranda and Tom Kitt (Tony and Pulitzer winner for “Next to Normal”). Kitt brings some truly gorgeous and complex melodies to the table here, much like his work in “Next to Normal.” For his part, Miranda continues to contribute to expanding the vernacular of Broadway music with elements of rap and hip hop starting to feel more and more like they belong on the stage. Highlights include “It’s All Happening” (though this might work better as a first act closer, not a second act opener) and the climatic number “Cross The Line” wherein our protagonists learn that winning isn’t everything and sometimes it’s best to stand out and play by your own rules instead of conforming to societal norms. And if the music doesn’t blow you away, the choreography and cheerleading stunts will. “Bring It On” will have you cheering in the aisles. 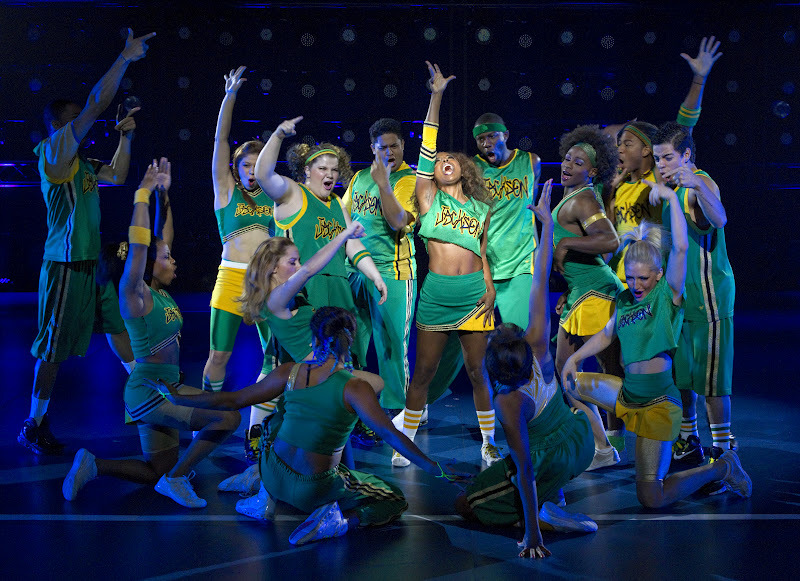 “Bring It On: The Musical” runs through Mar. 25 at the Cadillac Palace, 151 W. Randolph. Tickets, $18-$85. (800) 775-2000 or broadwayinchicago.com.